John Paul Stevens High School opened in 2005 on a site made famous by another John Paul. Within the last six years, NISD has also opened Sandra Day O’Connor High School and Earl Warren High School to serve the thousands of families moving to northwest Bexar County. Located west of Seaworld at Potranco Road and North Ellison Drive on the 75-acre site of the 1987 Papal Mass, the new high school is one of nine new schools approved by voters in the 2001 Bond Issue. Stevens High School will relieve overcrowding at Jay and Taft high schools. A few students may also come from the Warren High School attendance zone. The namesake, currently serving on the Supreme Court, was appointed by President Gerald Ford in 1975. 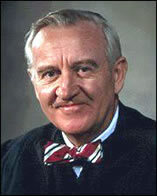 Justice Stevens considered becoming a teacher before joining the Navy during World War II where he received the Bronze Star. A Chicago native, Stevens attended the University of Chicago earning his degree in English literature. He earned his law degree from Northwestern University (Illinois). Justice Stevens authored the majority opinion in 2001 that provided for equal access for disabled athletes, specifically allowing a disabled golfer to use a cart during PGA competitions (PGA v Martin). He also wrote the majority decision that the Constitution does not grant a sitting President immunity from civil litigation (Clinton v Jones). Justice Stevens is highly respected for his integrity, honesty and impartiality. Stevens High School was built with funds from the voter approved 2001 Bond Issue. Designed by PBK Architects, it was built by Bartlett Cocke Contractors at a cost of $50 million. The 398,000-square foot, state of the art school will be two stories and designed with an abundance of natural light. Click here to purchase your YEARBOOK! Click here to purchase AD SALES!